Arthur Madore is a licensed massage therapist, (LMT). He is passionate about helping people get out of pain and have the physical lifestyle they want. He has over 25 years experience in medical settings primarily treating patients with difficult chronic pain and dysfunction. After graduating from a 3 year program at the Muscular Therapy institute he went on to do advanced certifications in Neuromuscular Therapy (NMT), CranioSacral Therapy, and Core Movement Integration (CMI). Each one took many years of training and practice. He is a certified teacher of NMT and CMI. He is the senior massage therapist at the Osher Clinical Center and fully credentialed at the Brigham and Women’s Hospital. His private practice is at the Carney Hospital. 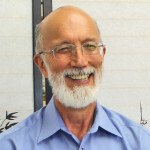 He is co-author of the chapter on massage therapy in the medical text book Integrative Pain Medicine. He has participated in several published NIH studies on low back pain. For many years he has taught massage therapy to physical therapy students, and movement therapy to a wide variety of clinicians. In his youth he has taught martial arts, swimming, and physical fitness. He is a long time triathlete and recent marathon runner. More recently he is working on developing his skiing and rock climbing skills. He has been happily married for over 43 years and has two athletic grandchildren.